Marco Rubio’s finances: Just got a little better after the New York Times’ report, according to Marco Rubio. 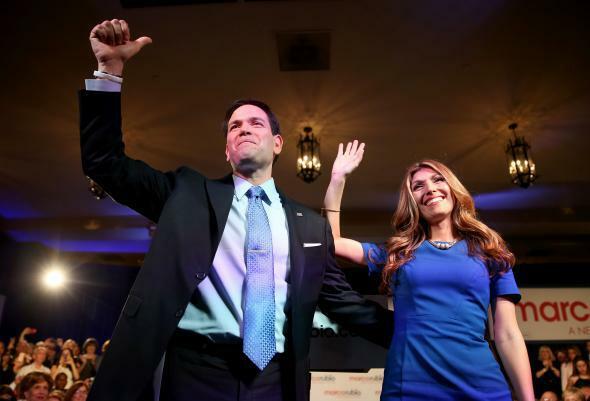 U.S. Sen. Marco Rubio stands with his wife, Jeanette Rubio, after announcing his candidacy for the GOP nomination on April 13, 2015. Marco Rubio is trying to use his past financial woes to help fill his campaign’s coffers, and he wants the world to know it. According to Politico’s Mike Allen, the Florida Republican’s camp claims it brought in $100,000 over the past five days as a result of a pair of much-discussed New York Times stories that pointed out Rubio and his wife’s history of traffic violations and difficulties managing their personal finances. Setting aside the vague sourcing and context of Allen’s report, it’s clear that Team Rubio believes that the best way to make questions about the candidate’s past go away is by first dismissing them as liberal smears, and then simply declaring victory. The every-man spin quickly took hold with a number of reporters wondering aloud whether Rubio’s personal finances would actually help him stand out in a presidential field that is full of the rich and absurdly rich. Others, meanwhile, suggested that the relatively weak traffic-ticket report had undermined the more noteworthy dive into Rubio’s financial history. The rapid defense-to-offense reaction was so successful that Rubio’s campaign manager sent out a snide “thank you” tweet to the Times on Tuesday. My colleague Jamelle Bouie has already explained why Rubio’s financial troubles do indeed matter, and to that I’ll only add that even if you disagree with his conclusion, it’s clear that the Times’ reporting offered information about Rubio’s past that will help voters better understand him. They know more about the first-term senator today than they did last week, and that’s a good thing in a world where candidates have too much control of their own narrative. If some Americans can relate to Rubio better because of their shared financial pain—and many very well may!—that doesn’t mean the Times story was a failure. The paper’s not perfect—nor was either of its articles—but that doesn’t mean it didn’t raise questions that are worth asking. It’s up to voters to answer them. As the Washington Post’s Chris Cillizza points out, Rubio has gone remarkably unvetted to date, especially relative to his perceived status as one of three Republican frontrunners with the best chance to earn the party’s nomination. As a result, the Florida conservative can expect much more vetting in the future from the Times and other mainstream outlets. Unless they turn up something truly damaging, his campaign, it appears, will be counting on it.